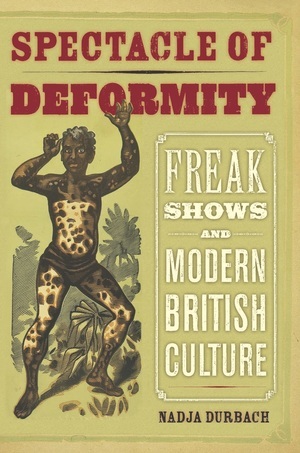 In 1847, during the great age of the freak show, the British periodical Punch bemoaned the public's “prevailing taste for deformity.” This vividly detailed work argues that far from being purely exploitative, displays of anomalous bodies served a deeper social purpose as they generated popular and scientific debates over the meanings attached to bodily difference. Nadja Durbach examines freaks both well-known and obscure including the Elephant Man; “Lalloo, the Double-Bodied Hindoo Boy,” a set of conjoined twins advertised as half male, half female; Krao, a seven-year-old hairy Laotian girl who was marketed as Darwin's “missing link”; the ”Last of the Mysterious Aztecs” and African “Cannibal Kings,” who were often merely Irishmen in blackface. Upending our tendency to read late twentieth-century conceptions of disability onto the bodies of freak show performers, Durbach shows that these spectacles helped to articulate the cultural meanings invested in otherness--and thus clarified what it meant to be British—at a key moment in the making of modern and imperial ideologies and identities. Nadja Durbach is Associate Professor of History at the University of Utah. She is the author of Bodily Matters: The Anti Vaccination Movement in England, 1853-1907.